*Corresponding author. Tel. : +91 3222 281888; fax: +91 3222 282212. E-mail address: renji.remesan@swr.iitkgp.ernet.in (R. Remesan). This study has proposed and investigated a novel input variable selection method for nonlinear modelling based on principle component analysis (PCA) and cluster analysis. The proposed approach was applied to daily rainfall-runoff modelling of the Brue catchment of the United Kingdom using wavelet based hybrid forms of two nonlinear models, Artificial Neural Networks (ANNs) and Local Linear Regression (LLR), to identify meaningful wavelet decomposed sub-series. The homogenous group formation capability of cluster analysis and redundancy assessment capability of PCA were applied effectively in this study to solve input selection uncertainties associated with wavelet based hybrid models. 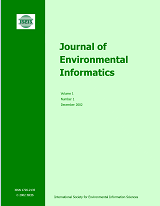 Though this concept has been represented in the selection of effective wavelet decomposed subseries in runoff modelling, the application has gotten wider implications in time series modelling with highly redundant and large input space. The study revealed the weakness of conventional forms of cross-correlation analysis and also suggested that input selection could be improved by making sufficient natural clusters (equal to the desired number of input data series) of input space and restricting the search within each cluster according to silhouette or correlation value. The study also highlighted the higher modelling capability of ANN over traditional LLR models in rainfall-runoff modelling of the Brue catchment.